The new distillery is Myers Farm Distillery which is an organic farm to flask distillery that grows, harvests and distills and bottles their own organic distillates right on their own farm. You can’t get much more organic, low carbon footprint than that. 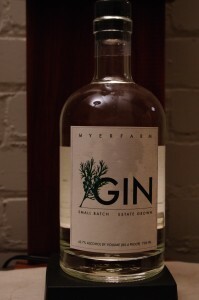 Their products include their Meyer Farm Wheat Spirit White Dog, Myer Farm Corn Whiskey White Dog, Myer Farm Gin, and their Myer Farm Wheat Vodka. An Aged Wheat Vodka has been laid down and currently aging for sale at a later point to be determined. Established in 1868 the farm is a family farm of roughly 1000 acres that grows organic grains and just recently they caught the distilling bug. Grown on their farm the organic white winter wheat is a softer and more unusual wheat than the more common you usually encounter in distilling. This white dog corn whiskey is distinguished from a vodka in that it is brought off the still at 160 proof ( rather than a standard vodka distillation of 190 proof) to preserve the flavor and character of the wheat rather than going for a more flavorless vodka type base spirit. Appearance: Bright clear, on swirling leaves a nice coat on glass with legs rapidly forming. First Impression: Interesting spicy character with Juniper in background rather than foreground,Then suddenly after swirling the cinnamon, ginger and lavender jumps out at you, with a fair amount of orris root, cardamom, coriander and angelica (clove ?) . Taste: Delicious – Reminiscent of a 5 spice powder or Chinese spare ribs it is a very interesting New World type gin and very refreshing. A very different but intriguing taste with the cinnamon,lavender and coriander edging out the juniper. Bottle: Heavy clear bell or apothecary shaped bottle with heavy decanter bottom. Simple but tasteful graphics on a paper label ( in this case it has a graphic of a Juniper branch with berries) and a black synthetic cork with a nicely ridged top make it easy to open. Overall a nicely done if not overly distinctive package. Other: Organic and farm to flask on site – doesn’t get much greener than this! Final Thoughts: A well done if rather unusual gin.